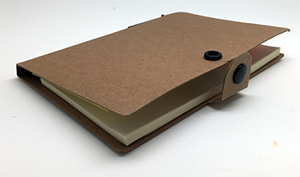 This small notebook comes with a heavy cover made of recycled paper. It contains 5 adhesive neon colored marker strips, 25 pages note pad and 50 pages of recycled unlined creamy color paper note book. A recycled paper pen is also attached with a black snap closure.